For intestinal colics, sensibility to changes in the weather, in case of headaches, insomnia, rheumatics and gout nervous problems, varicose vein, lack of blood. Flaxen honey, excellent as a sweetener for beverages. Serve with yogurt, mascarpone, ricotta cheese, blue cheeses, meats and fish in sauce. Mead 500 ml. - Beerenhof South Tyrol 10,55 EUR / 21,10 €/lt. Chestnut honey 500 gr. - Apiary Dolomiti 11,50 EUR / 23,00 €/kg. Lavender honey 500 gr. Plattner bee's court South Tyrol 11,35 EUR / 22,70 €/kg. Honeydrew honey 500 gr. - Apiary Dolomiti 9,90 EUR / 19,80 €/kg. Fir Tree honey 500 gr. 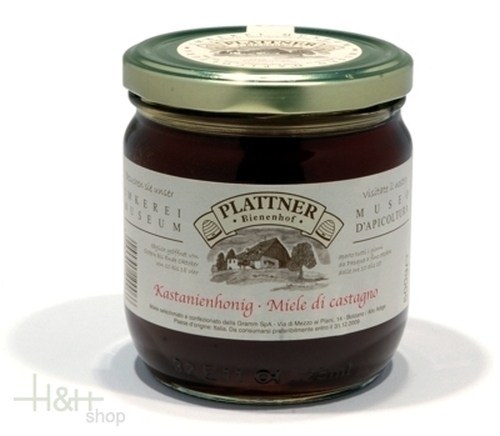 Plattner bee's court South Tyrol 13,40 EUR / 2,68 €/100 gr. Orange honey 500 gr. Plattner bee's court South Tyrol 11,35 EUR / 22,70 €/kg. Sweet Clover honey 500 gr. Plattner bee's court South Tyrol 9,25 EUR / 18,50 €/kg. Flowers honey 500 gr. - Apiary Dolomiti 12,45 EUR / 24,90 €/kg. Acacia honey 500 gr. - Apiary Dolomiti 14,55 EUR / 29,10 €/kg. Chestnut Honey 400 gr. - Regiohof 11,15 EUR / 2,79 €/100 gr. Dandelions Honey 400 gr. - Regiohof 11,15 EUR / 2,79 €/100 gr. Alpine Forest honey 1 kg. - Apiary Taschler Edi 19,25 EUR / 19,25 €/kg. Eucalyptus honey 500 gr. - Apiary Dolomiti 12,25 EUR / 2,45 €/100 gr. Alpine Blossom honey creamy 1 kg. - Apiary Taschler Edi 19,25 EUR / 19,25 €/kg. Flowers honey 500 gr. - Apiary Dolomiti 9,55 EUR / 19,10 €/kg.